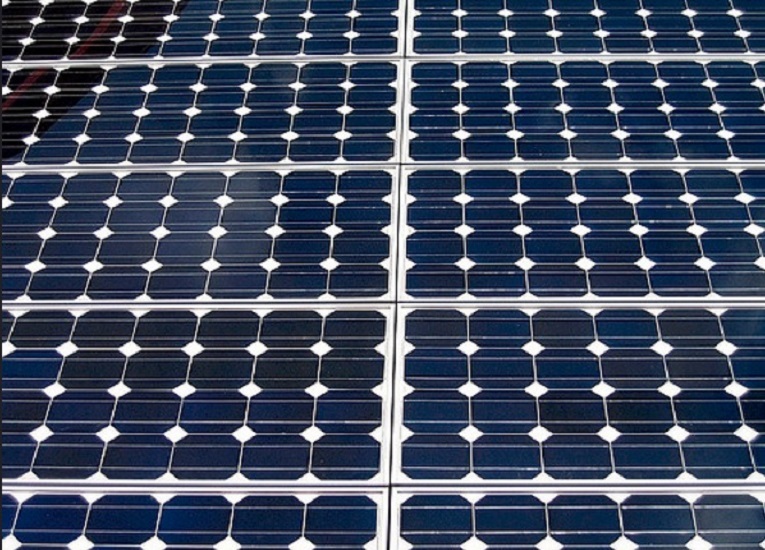 Solar panels were on display at the Minnesota State Fair. A study published on Aug. 24 by National Renewable Energy Laboratory (NREL) in partnership with Clean Energy Group (CEG) found that approximately 25 percent of all commercial customers in the United States could cost-effectively reduce their electric utility bills through onsite battery storage. The white paper, titled “Identifying Potential Markets for Behind-the-Meter Battery Energy Storage: A Survey of U.S. Demand Charges,” reported that some of the most promising market opportunities are in locations outside of the “first-mover” states known for progressive clean energy policies (such as California and New York). These other states with promising markets include Georgia, Kentucky, West Virginia, Alabama, Michigan, Iowa, New Mexico, and Texas. Commercial properties are charged for energy demand, in addition to energy consumption, plus fixed monthly fees. Public buildings, nonprofit organizations, community centers, and even multifamily housing are subject to the commercial pricing structure too. This report is significant for three reasons. First, a demand-charge study of this magnitude has not been made public prior to now. Second, the findings demonstrate onsite battery-storage technology is cost-effective for many commercial customers now, not sometime in the future. Third, the report highlights viable market opportunities for expanding behind-the-meter energy storage – meaning a battery paired with solar power – into new regions of the country. 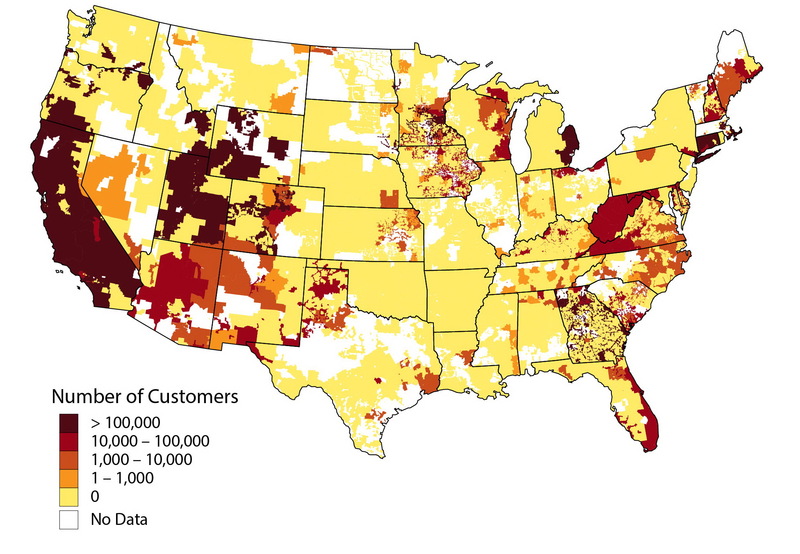 Researchers at NREL conducted a comprehensive survey of more than 10,000 utility-rate tariffs for commercial customers in 48 states. The research pertained to customers that subscribe to electricity tariffs with demand charges over $15 per kW. According to Seth Mullendore, project director of the Resilient Power Project at Clean Energy Group, utility rates are not publicly available in an easily accessible manner. So much of the research was done via data-gathering. Although the economic opportunity for battery storage must be evaluated on a case-by-case basis, the report concluded that approximately 5 million customers were able to subscribe at or above this demand charge threshold. This means close to 25 percent of commercial customers could cost-effectively reduce their utility costs with battery-storage technology. “This kind of utility survey and market analysis hasn’t been done before. There are some studies that identified selective utility rates, but a study as comprehensive as this has not previously been done,” Mullendore said. While energy storage is generally cost-prohibitive for the residential sector, it can be economically attractive for the commercial sector since it is subject to a different billing structure. Mullendore said Clean Energy Group was particularly excited about the report because of its staff’s work with the Resilient Power Project. The project targets the deployment of solar PV plus energy storage to power essential services for affordable housing and community facilities in low-income and/or disadvantaged communities. They are using the results of the report as a tool to identify communities to engage. For example, this involves talking to community groups in Georgia about battery-storage opportunities based on the economic case made by the report. Although solar PV and energy efficiency measures can reduce overall utility bills, they do not reduce demand charges. Demand charges are calculated based on peak demand events – times in which demand peaks within the billing period. These demand charges can comprise from 30 to 70 percent of a customer’s utility bill, according to the white paper. However, behind-the-meter battery storage can store energy produced during times of low demand and deploy it during times of higher demand, thereby shaving peak demand charges and giving customers the opportunity to respond to pricing signals. For example, with a commercial demand charge threshold of $15 per kilowatt and peak demand reduction from 125 kilowatts to 60 kilowatts, battery storage could reduce the demand charge by close to $1,000 for the billing period. This amounts to an annual savings of $11,700. Reprinted with permission from the “An Introduction to Demand Charges” fact sheet by NREL and CEG. The analysis determined that economic opportunities for storage exist in first-mover states with progressive energy policies, such as California and New York. But they are also viable in less-predictable states across the Midwest, Mid-Atlantic and Southeast. The report also challenges assumptions that battery storage is only economically viable in states with high utility prices. It found that even states with lower electricity prices had some of the highest demand charges. These include Colorado, Nebraska, Arizona and Georgia. These states could therefore greatly benefit from energy storage. Projected decreases in the cost of battery storage technology will only increase this market potential. The electricity customers that can subscribe to tariffs with demand charges over $15/kW. Graph by NREL and CEG from "Identifying Potential Markets for Behind-the-Meter Battery Energy Storage: A Survey of U.S. Demand Charges." Reprinted with permission. According to Mullendore, more work is needed to determine how these customers consume energy. 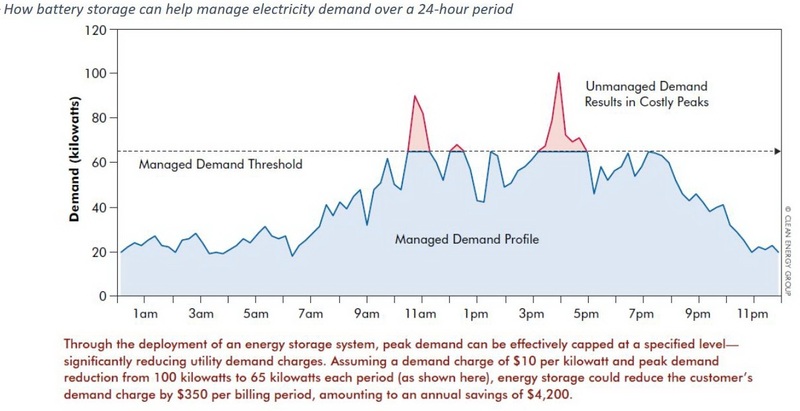 By examining load profiles, researchers could identify which customers would be candidates for using storage to economically reduce demand charges. Mullendore said the economics of battery storage are more appealing for customers with narrower peak-demand events. The authors’ hope is that the results of the study will highlight state specific opportunities for behind-the-meter energy storage. It demonstrates that it is currently a viable solution, helping cost-effectively reduce electricity bills for customers within the commercial sector.